Education: Bachelor's degrees in psychology, robotics & biological engineering, master's degrees in political science, military science, mechanical engineering, astrophysics, dual doctorates in genetic engineering and medicine. Distinguishing characteristics: There is a tattoo of a lion's head on his right shoulder. It can't be seen through the ceremonial vestements he wears while performing superheroics, but it glows when he uses any of his special abilities. He also has a two inch scar on the upper left side of his head, beneath the hair, from a training accident in his youth. Skills/abilities: Like his father, Dr. Okonkwo has an off-the-charts IQ and vast, detailed studies in a variety of fields. As well, after being immersed in the herb-tinted waters of the Forbidden Lake Ptah, he has inherited the powers of the Pride, a genetic heritage of the Kunganchians, giving him peak human performance in agility, speed, strength, endurance, stamina and reflexes. He is able to lift (press) 500 pounds, has a 72" vertical leap, is able to run 30 miles per hour for up to two hours without becoming fatigued, has a reaction time of 0.08 seconds. His senses fall just shy of superhuman levels. 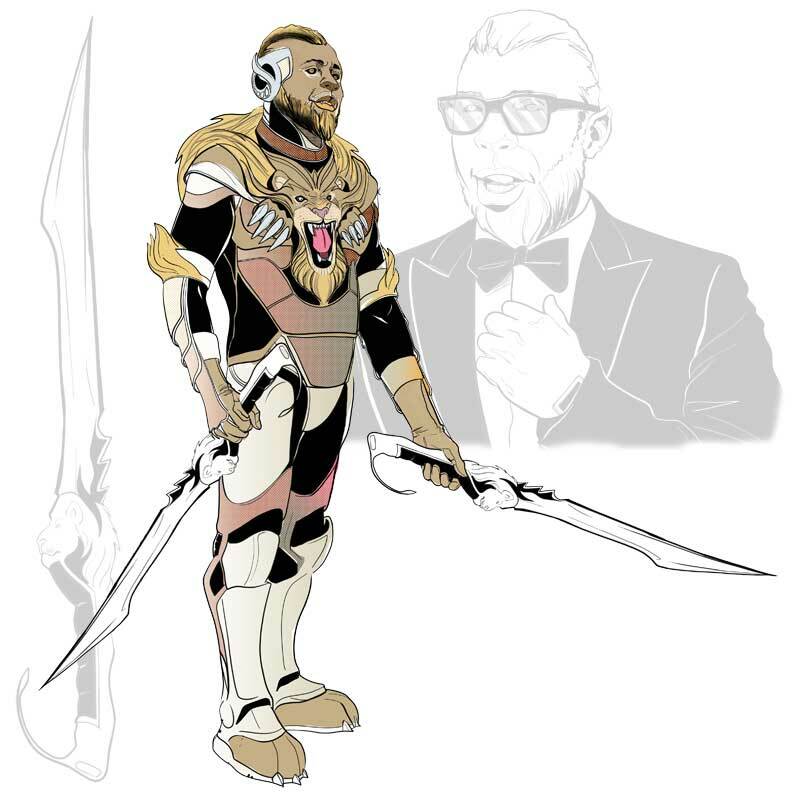 Pride wears a uniform incorporating the transdimensional element azizium which assists him with "planeswalking," interdimensional teleportation that allows him to move from place to place silently and tracelessly up to 200 total miles per day and transfers the energy from impacts to his person harmlessly into space forty thousand miles from earth through quantum entanglement. Pride wields a pair of azizium machetes which can be used for a variety of purposes from simple spellcasting (illusions, disrupting the quantum state of an object to take it out of phase with our plain of reality for ninety seconds) to slapping something with the flat of the blade for an impact of up to 50,000 pounds per square inch. Pride is the protector of the world's largest deposit of azizium (there is a football field-sized cache under the arctic circle and another similar sized one buried in the ocean half way between Madagascar and Australia, both heavily guarded by Kunganchian Jackals), which descends miles below the Kunginchian territory, and its power, connected with the ancient goddess Sekhmet, gives him the ability to change into a were-lion creature that has superhuman levels of his already amazing abilities and -- in extreme measures -- allows him to call down Sekhmet's Wrath, inundating an area up to 50 yards around him with flames of 1000 degree Fahrenheit. The last ability he can only do once every year. Best known for: A dramatic near-war with the west over intrusions by the intelligence community into Kunganchian sovereignty, doing a killer duet of "Cult of Personality" with Supernatural at a karaoke night, being a huge Doctor Who fan. Brief personal history: The isolationist eastern African nation of Kunganchi ("Kunga" = "secret," "nchi" = "nation" from the Kiswahili) was a mystery for decades to many of the western world. Originally founded as a settlement of an international abolitionist group looking to repatriate freed Africans to something resembling their homelands. Led by Madame Aretha Jenkins and a cadre of pan-African diasporic leaders, the newfound nation seemed to carry on with subsistence farming and behaving as a standard U.S. influenced democracy until 1847, when mysterious fifty foot tall barriers appeared along the coast line and at every border, prohibiting access. Endlessly smooth, they could not be scaled nor summited, and curiosity faded quickly about what was happening inside. Despite being sandwiched between Kenya and Somalia, there wasn't enough land for this lost country to be of much interest to anyone. Once air travel became common, people attempting to fly into Kunganchi were buffeted by ruthless winds, making it impossible to cross the border safely. From their vantage point, they reported seeing nothing but jungle canopy as far as they eye could see. As airplanes advanced, this state did not change, with even high altitude airplanes unable to fly in Kunganchian airspace. After the satellite boom of the 1960s, it was possible to view Kunganchi from space, but nothing but dense forest canopies were recognized. The western powers thought nothing of this and ignored the secluded section of the world. After the 1968 conviction of Huey P. Newton, odd samples of an unknown element called "azizium" began to show up. Oddly stable for its high electron count, this strange material was enormously powerful and seemed to exist in a quantum state, not fully in our universe. Less than four millileters of the material were available in the entire world, and its existence was a closely guarded secret to the intelligence communities of the communist and capitalist worlds. Using a widely-unproven form of orbital insertion, financier R.P. Bartley (father of The Statesman) led a trading expedition into the area in 1994, where only three members of the team survived but the elder Bartley was able to broker a peace between Kunganchi and the United States. This led to the first exposure of Kunganchian culture and science to the world ... which was quite a shock. Kunganchi launched its first orbital platform in 1875 after Madame Jenkins' discovery of a mound of azizium the size of Dallas, Texas in 1846, given to her (in her words) in a vision from the lion goddess Sekhmet. According to Kunganchian lore, Sekhmet demanded that the new, unified people of this land burn away the ways of the past and accept a new path, building in the traditions of her husband Ptah and not her own destructive manner. The first thing Jenkins and her inner cadre, 24 friends and advisers known as the Dozens, did was establish the barrier that protected the border of Kunganchi, utilizing learnings from a pyramid hidden beneath Lake Ptah. Three years of brutal internal fighting came as Jenkins threw out the constitution and established the monarchy that remains in place today, purging elements she felt did not fit the pan-African vision she wanted to build, calling them "unfortunate side effects." With all opposition swept away and a new nation, comprised of people casting off their former allegiances and origins for a new future together, Jenkins devoted most of the country's resources to self sufficiency and science. The first airplanes flew in Kunganchi in 1852, their first mass transit was installed in 1856, the entire country was wired with azizium for electricity and communications in 1863 and they created their own form of the internet, called Griot, in 1868. Along the way, they discovered means to burrow under the ground and "repatriate" mineral assets from other areas, amassing huge caches of diamonds, gold, copper and rare earth metals. Using their orbital platforms as a transit hub, this allowed them to travel the globe and engage in trade anywhere without ever revealing their true nature, amassing a huge fortune and doing what they could to hinder the spread of western imperialism. The Kuganchian leader, Dr. Kofi Okonkwo, apparently spent years abroad studying under forged Nigerian credentials and was well versed in the ways of the west. His title as tribal chieftain of the land was "Mkusanyiko-Simba," which translated to "Pride" (as in a pride of lions). Only he and carefully chosen members of The Dozens knew that he worked as a functionary of the Shadow Queen, direct descendants of Madame Jenkins, who ruled to this day. Dr. Okonkwo agreed to visit the United Nations with Bartley, where they both had to join forces before a rogue Communist agent could detonate a neutron bomb and kill all the assembled delegates. Dr. Okonkwo and Bartley formed a friendship based on mutual distrust and respect. Two years later, the Belgian/Chinese physicist Hector Fang tracked down rumors of a large cache of the mysterious element azizium being in Kungachi after discovering Chinese spies recovered an entire millileter from a 50/40 Project black site. Fang killed three Kunganchian scientists and made suits of their skins, using such purloined credentials to gain access through the border for himself alongside a team of mercenaries. Fang committed regicide as Dr. Okoknwo died leading a faction of Jackals (the Kunganchian army) to stop them and incapacitating the king's brother Lumumba by chopping off his right hand. While Fang's men tried to access an underground cache of azizium, they were met by the seventeen-year-old Hifikepunye, who was armed to the teeth with an American M-249 on a tripod, several pistols, a machete and a host of grenades. Hifikepunye killed all but two of Fang's men and crippled the physicist, who was dragged to safety by the last of his men, who glimpsed the the capital of Takriban Peponi ("almost paradise") under the everpresent canopy of trees in the ensuing chaos. Lumumba could never be "king" after his failure to stop the regicide and Hifikepunye was too young, so the Dozens and the Shadow Queen determined that Lumumba would serve as regent until Hifikepunye was of age. Lumumba's honor could only be served by ensuring that Hifikepunye became the king the nation needed, so he funded every educational opportunity and sought out masters of every discipline to help the young king ascend to greatness. The young Hifikepunye had already completed four bachelor's degrees by the time he was eighteen, and at the age of 25, he had completed all of the education he could find, mastered fourteen different martial arts, successfully founded Kunganchi Industries based on azizium-derived technologies and overseen the insertion of intellegence agents from the Askari Mchunga (secret overseer) directorate in multiple countries. After defeating a gauntlet of Kunganchi's greatest, including his uncle Lumumba, in a variety of challenges of intellect and prowess (chess games, invention contests, and more), Hifekepunye was given access to the hidden underground Lake Ptah and allowed to bathe within. Only members of his bloodline can enter the waters without dying instantly and painfully, and he emerged as Pride. Since then, he's been a cagey diplomat and acted as a "super hero" serving alongside the world's most prominent extrahumans while always furthering his country's goals.